Governor of Benue state, Samuel Ortom, reveals he has been given a red card and now standing outside the pitch. 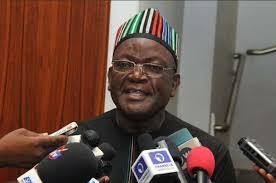 Ortom, who was elected governor on the platform of the ruling All Progressives Congress (APC) says he is a free man. Speaking after swearing in of Jerome Shimbe, his special adviser on bureau for local government and chieftaincy affairs, Ortom said he would let his people know, which political party, he’d join next. “Many people have been asking that after dedicating the state to God we are still facing challenges, but I know that the God that saw the Israelites pass through the wilderness, and took them to the promised land will also see us through our difficult times,” he said. “I know one thing, all these challenges that we see today, we shall see them no more. All that we are required to do is not to begin to be wayward in our conduct but to move to the righteous side of God. Once we do that, things will work out for our good. “Looking at what is happening to us, sometimes am tempted to think that we are dying like people who do not have God. But we must choose the path of working with God, obeying and serving him. If we do that and ensure that his values get into our hearts and we work with him, development will be inevitable. Let us work and encourage those things that can develop us.